Barcelona logo of jumping athlete over Olympic rings. 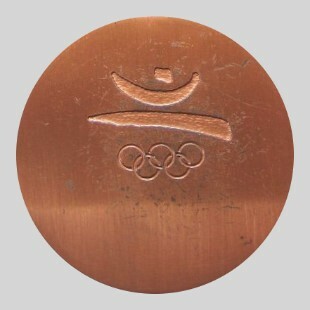 The Olympic Charter, 1987 edition, specifies that the competitors classified in the first three positions in any of the Olympic sports events must receive a medal with the name of the sport in question engraved on it. 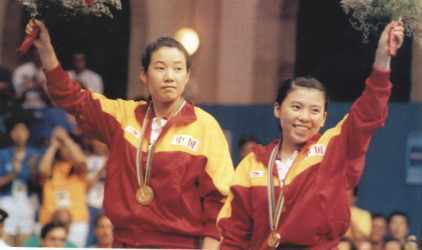 The winner's medal must be made of silver gilt, the runner-up's of silver and the third competitor's of bronze. The Charter also establishes that all the medals must be at least 66 millimetres in diameter and 3 millimetres thick and the sterling silver of the medals for first and second places must be at least 925/1000, with a layer of at least 6 grams of fine gold on the winner's. Starting from these conditions and the tradition -uninterrupted since Amsterdam in 1928- of including an image of the goddess of victory on the obverse, COOB'92 commissioned the design of the Barcelona medals from the sculptor Xavier Corberó. The medal he designed was 70 millimetres in diameter and the ribbon with the Olympic colours was attached. The reverse was divided horizontally into two parts; the emblem of Barcelona'92 appeared on the upper one. 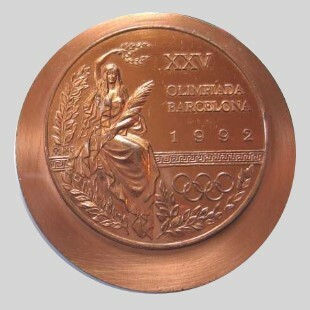 The obverse showed a medallion 56 millimetres in diameter, superimposed on the medal and slightly off-centre, on which the image of the goddess of victory appeared, drawn in a Modernist style, together with the words "XXV Olimpíada Barcelona 1992". All the medals were manufactured by the Fábrica Nacional de Moneda y Timbre, which also met the costs.